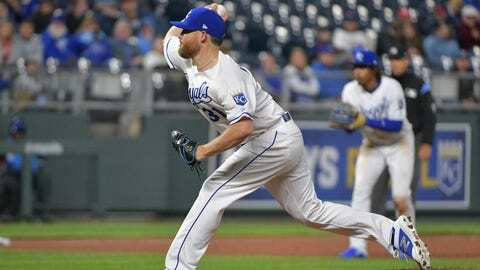 Ian Kennedy blew his first save since moving to the bullpen as the Royals fell to the Twins on Tuesday night. KANSAS CITY, Mo. — From his vantage point in the dugout, Rocco Baldelli had no idea whether the chopper that Nelson Cruz hit toward third base with two outs in the 10th inning Tuesday night was fair or foul. Cruz’s clutch single off of Brad Boxberger (0-1) gave him three RBIs, and it gave the Twins a reason to be happy after outfielder Byron Buxton left with bruised ribs and the club left 14 runners on base. The Royals’ bullpen nearly coughed up the game right after Keller took a bow. Tim Hill allowed back-to-back singles to the only two batters he faced, and Wily Peralta issued a full-count walk to load the bases with nobody out. But their erstwhile reliever bounced back to bookend a pair of strikeouts around a lineout and left the bases loaded.